The Problem of Perspective is that if every episode is about a life-or-death struggle to save the Earth or the galaxy or the Universe then it gets harder and harder to care with each passing crisis. This is especially problematic where end of season finales are concerned; how can something be a climax when everything leading up to it is just a succession of climaxes? The show became too big. It too often revolved around stories in which The Doctor has to save the entire world on a weekly basis, and in so doing it squeezed out the smaller-scale adventures that the original series did so well. I mean, the small stories still involved intergalactic travel, life-and-death decisions and moments of terror, but they were often about trying to save a handful of people or thwart a relatively small scheme. You cared about whether The Doctor succeeded because even the lives of seemingly insignificant beings mattered to him, not because failure meant the end of the Universe. This season, however, has been composed entirely of those kinds of stories so far. They have occasionally been epic in scope, or have utilised special effects to give a sense of scale, but the adventures themselves have been focused on adventures that have a potentially small impact. Even the one about a dinosaur showing in London was a mystery about people going missing, while last week's episode was about nothing (in a metaphysical, rather than Seinfeldian sense) and never even threatened to be about more than a dream that has been bothering The Doctor. Maybe it's because we're starting with a new Doctor and Peter Capaldi brings a different, more intense and focused energy to the show, or perhaps it's a reaction to last year's specials, which were huge, both in terms of scope and their impact in the real world. Regardless of the root cause, this development is a welcome one that has delivered one of the best runs the show has managed in years. 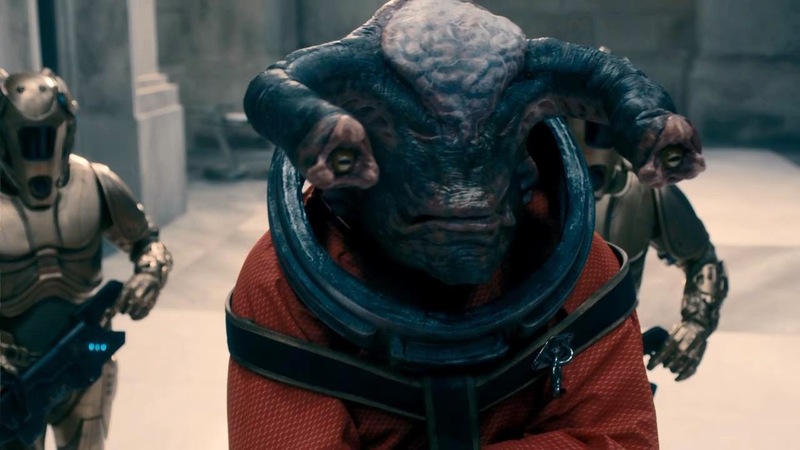 "Time Heist" is a great example of the small-focus, grand-scale storytelling that the show had been lacking before. It's a story that finds The Doctor and Clara teaming up with a hacker named Psi (Jonathan Bailey) and a shapeshifter named Saibra (Pippa Bennett-Warner) in order to break into the Universe's most secure and opulent bank. Visually, the episode emphasises the sheer enormity of the bank and the number of treasures contained within (even if chunks of it still boil down to The Doctor and Clara running through some suspiciously similar-looking corridors; CGI costs money, after all), but in terms of what the episode is about, it's just about four people trying to break into a bank. Not because doing so will irrevocably change the course of human history or avert a huge disaster, but because they need to get something from the bank. Of course, they don't actually know what that something is, at least initially. After an introductory scene in which The Doctor tries vainly to dissuade Clara from going on a date with Danny (to what looks like a school disco night, judging by Clara's attire), he receives a call on the TARDIS' phone. Since hardly anyone has that number, The Doctor decides to answer, only for he and Clara to find themselves in a darkened room, sat opposite Psi and Saibra, holding disgusting grey worms and with no idea of how they got there. The worms, The Doctor informs us, have the ability to wipe memories, and they learn that they have been brought together by a mysterious figure known as The Architect in order to carry out the aforementioned robbery. It won't be easy, though, since they have to fool the bank's DNA recognition software (which is where Saibra's shapeshifting comes in), work around their security protocols (which is where Psi's augmented hacking skills comes in) and evade the bank's most formidable defense: a psychic minotaur called The Teller who can sense guilt, then cause his targets' heads to collapse in on themselves. (Doctor Who continues to be excellent at generating nightmare fuel. I didn't even know I was afraid of concave heads until today!) All in all, it's a pretty tall order, not that that's ever stopped The Doctor from doing anything. Continuing this season's theme of dropping The Doctor and Clara into different genres and seeing how they fare, this is Doctor Who's version of a heist movie, right down to the way the music at times resembles the cool yet vaguely nervy jazz that has become synonymous with sleek cinematic heists. While the memory wiping serves a narrative purpose - by removing their memories, the team are able to remove their guilt and avoid, at least for a time, The Teller's attention - it also removes all the usual set-up and planning that goes into these kinds of stories. They start in media res, then get down to carrying out the heist, which makes for a swift and entertaining episode, and adds an air of mystery as well as we wonder why they're breaking into a bank and who they are working for. The script, co-written by Moffat and Stephen Thompson, does a nice job of inverting the typical heist movie structure, while also using that inversion to create dramatic stakes, while also peppering it with sharp dialogue and scenes of tension as the team try to figure how to outsmart the bank's defenses. In the end, it turns out that The Architect was actually The Doctor in a hoodie, which isn't that big of a shock (well, okay, the hoodie was), and that he was the one who orchestrated the entire enterprise. What was surprising was the reason behind it all, and it reaffirmed the idea that the show is committing to telling stories that aren't about saving the galaxy on a weekly basis. Throughout the episode, the team are competing against the bank's malicious owner, Madame Karabraxos, as well as her copy Ms Delphox (both played by Keeley Hawes, best known to fans of vaguely smutty prestige dramas for co-starring in the BBC adaptation of Tipping the Velvet, and to gamers for frequently voicing Lara Croft). When they confront her, right as a solar storm is about to destroy the bank, The Doctor realises something, hands her his phone number, and says that she will call him when she is old and full of regret, which she does (or did, depending on your perspective). A much older version of Madame Karabraxos was the one who called The Doctor and asked him to assemble his team, all so that they would be able to free The Teller and its mate, whom Karabraxos has been holding prisoner in her private vault as a way of controlling the two of them. At the end of her life, she realises that this is an immensely cruel thing to have done, and enlists The Doctor to help her undo her great crime. (It's all a little Bill and Ted, in terms of using time travel to resolve a story, but like "Listen" it employs time travel in a way that is dramatically and conceptual interesting.) After all the heist shenanigans, deceptions and disguises, it turns out that the whole job was just to rescue two creatures who were the last of their kind, and to redeem a sad old woman who realised her error too late do anything about it, but not too late for The Doctor to do something. It was a big, elaborate plan to achieve a relatively small result, but that's what The Doctor does: He cares about the little things, even when the little things are six-foot tall monsters who can psychically crush someone's head. "Don't be so pessimistic, it'll affect team morale." "What, and being blown up won't?" - Though this episode was going for an Ocean's 11 vibe (Oswald's 4, perhaps? ), the thing it reminded me of most was Farscape. That's partly because Farscape is one of my top 5 science fiction shows ever, so I like to make connections where possible, and because The Teller looked like the sort of practical creature effect that show did so well, but also because Farscape had lots of episodes that were basically heists, and they also had a penchant for telling stories in which the monsters turned out to more than their appearance suggested. - Another week without the mysterious Missy, but there was a little more movement on the Clara/Danny relationship front. Judging from the previews for next week's episode, it looks like the show is going to deal with the practicalities of dating a time traveller (though not in the weepy Audrey Niffenegger sense). I'm hoping for a spin on the classic "two dates at two restaurants at the same time" sitcom trope, but instead of two restaurants, it's one restaurant and a Sontaran battle cruiser or something.